Yup - I've been feeling poorly, poorly enough to take a day off work and rest up at home. 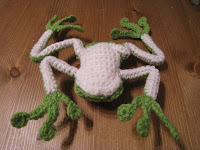 Sitting back my fingers itched to make something cute to cheer me up - and what better to make when you have a sore throat - a frog of course! 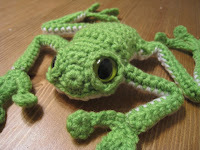 I've been wanting to make up the excellent pattern of a tree frog from the Roman Sock blog (this site has some beautiful free patterns and is well worth a good long visit) for about a year now and I've only been holding off as I couldn't find red cats eyes anywhere. Finally I bit the bullet and made do with some green eyes that I already had in my stash, and I'm so glad that I did. 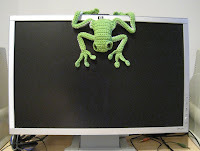 Because of using green eyes I decided to stick with green feet too as I thought it would be better to do a good old fashioned frog rather than a half attempt at a tree frog. I've just officially fallen in love with this guy - I had great fun taking his photo earlier and I'm really going to find it very hard to give this one away. Sadly he is intended for a friend's Birthday, but I doubt it will be long before I make one up for myself.